Playa d’en Bossa, Ibiza, queen of beaches! 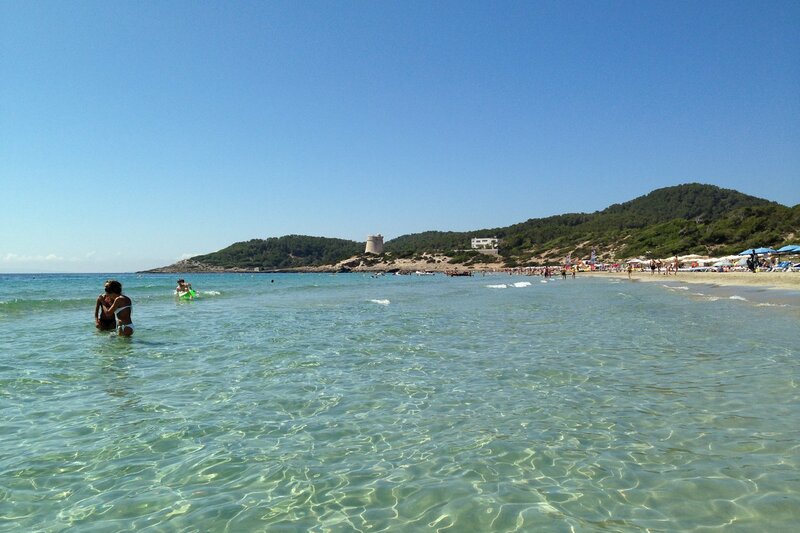 The first thing to note about Playa d'en Bossa, Ibiza is that it's very long, the longest beach on the island in fact. The change of personality is so tangible as you walk along from end to end that it feels like three completely different beaches. Beginning at the bottom end of Playa d'en Bossa (closest to Figueretas), although quite busy the beach has a relaxed feel. You'll find lots of families, couples and smaller groups enjoying the smooth sandy shore and shallow waters, along with a good variety of reasonably priced beach bars and restaurants. As you continue in the direction of the distant thudding, this Ibiza beach starts to fill up with a decidedly more clubby bunch. A favourite of large, hedonistic groups of all nationalities, time to oil up, get the sequined headbands out and order a vodka red-bull. And that's just the boys. Congratulations ladies and gents, you've just hit the beach-clubbing mecca of the universe! It's true that BoraBora has seen its competition explode over the past few years with Ushuaïa, Sands, Sirocco, Delano Beach Club, Nassau and a myriad of others setting up shop on their doorstep. But they are the Playa d'en Bossa originals. What they don't know about throwing a decadent Ibiza beach party could be written on the back of a grain of sand. There's still nothing quite like the ambience of sheer, unadulterated, uninhibited fun that this legendary Ibiza beach bar doles out each summer. Around 5pm is when the soundsystem gets turned up and mayhem breaks loose. Or be there earlier, around 3pm, to take advantage of the club PRs who give out freebies in the zone everyday. Don't be shy, shout ‘em over and see what they've got! As you tear yourself away from the hordes of unfeasibly tanned and happy ravers, you'll soon be hitting the mid-top stretch of Playa d'en Bossa that attracts a slightly more reserved and well-heeled crowd, although no less into their music. The beach at this end is particularly wide and expansive, so although it's busy, there is still plenty of space. There are some brilliant water-sports around too, from paddle-board, kayaks and windsurfing, to diving, flyboarding and boat hire. Think Ushuaïa, Hard Rock Hotel, Nassau Beach Club, Sirocco, (now where Sands used to be, roughly in the middle of Playa d'en Bossa beach) and Sands (now where Sirocco used to be, up near the top end before the watchtower). All of these bars and hotels are high quality and some host the biggest parties and DJs on the planet. There are day-time parties galore: head to Sands on Saturdays, Ushuaïa's day-time pool parties and international live music at Hard Rock. Just check out this video of Carl Cox's 50th Birthday party to give you an idea of the vibe. Of course Space is also just over the road and Sankeys round the corner. For night time shenanigans, take a look at our full clubbers' guide to Playa d'en Bossa right here. And if all that was still not enough to fill up your beach-party hump for an entire year, then some of the island's best boat parties leave from Playa d'en Bossa. Check out cirque de la nuit and float your boat, Carl Cox and We Love's very own rocking boat of beats. Holy smoke! If this all has you twitching your feet in excitement, then take a look at these fab, thoughtfully compiled Playa d'en Bossa hotels, apartments and villas! Of particular note is Ibiza Sun Apartments who are offering a very decent 10% discount throughout June (that should cover the cost of a couple of club tickets!). Spotlight also loves this stunning, modern nearby villa for up to 8 guests, Modern villa Ibiza town (Ref. 030). Far enough away to be an utterly peaceful retreat now and then, yet close enough for a cheap taxi to the action. Nice. Top tip: Do be vigilant with your belongings on Playa d'en Bossa. Thieves are known to target the area, especially during peak season. They're on the look out for the most obviously inebriated, so save youself an inconvenient visit to the police station and keep your eyes peeled. And, please, please respect the environment and take your rubbish with you - it creates havoc with marine life if blown into the sea. So please, do help to keep Ibiza clean and beautiful and most importantly, enjoy!